Balancing the growth habits of maize with the feeding value of the resultant silage is often difficult. Achieving a good yield must not be at the expense of feeding quality. 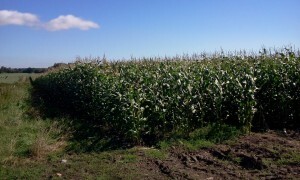 Immature maize silage is often acidic with low starch levels and animal performance is poor. We aim for a 30% Dry Matter, 30% Starch silage. Maximizing yield at that standard is our aim. Different varieties suit different situations. There is always a need for high quality, consistent varieties with good early vigour. Our seed is sourced from Limagrain who are now developing varieties with higher digestibility and, therefore better animal performance. Any qualifying variety is stamped with the LG Animal Nutrition or LGAN logo. This award is only given to varieties with excellent all-round crop performance and which deliver silage of superior nutritional value. Grown in Yorkshire since 2011, we can confirm this exceptional earliness. For an early maturing variety it can achieve good dry matter and starch levels. It is now on the NIAB Recommended list where it is the top variety for starch yield in the Less Favoured Area data. It appears to dry down quickly at harvest giving a very nutritious feed. This variety will be suitable for marginal maize growing areas and is particularly suited to late sowing on good land (such as after an early first cut silage). Again, we have seen this variety grown locally since 2011. It has exceptional early vigour and gives a very big crop. It is very reliable with good yields even in sometimes difficult seasons. It is on the NIAB Recommended list as the highest yielding early variety and tops the ME and Cell Wall digestibility chart in the Less Favoured Area data. Local crop reports back up the NIAB data, showing it combines a very high yield with good long cobs and early maturity. Nutritionally it is the biggest selling variety and would be our first choice on good land. In the UK, there is still a large amount of this variety sown each year because of the consistent yields. Grown since the 1990’s it achieves good yields and maturity every year and is very reliable. The cost of the seed is also in it’s favour. Well placed in the NIAB Descriptive List this has proved to be a very reliable variety over different soil types in the three years we have seen it grown locally. It is slightly earlier than Ambition and suits more marginal land. It will take over the role previously held by Destiny in our catalogue. New for this season, Reason looks highly promising and suitable for growing in Yorkshire. We are expecting it being a high yielding Maturity Class 10. For farmers looking for a new variety to grow this has to be a good option.